Journal bearings are considered to be sliding bearings as opposed to rolling bearings such as ball bearings. Despite this categorization, a shaft spinning within a journal bearing is actually separated from the journal bearing’s metal facing by an extremely thin film of continuously supplied motor oil that prohibits metal to metal contact. As such, the journal bearing allows the crankshaft to normally be contacted only by oil, which explains the long life of engines that get regular oil changes. The four major parts of a journal bearing are the shaft journal; the removable bearing shell halves, usually steel with a soft alloy lining; the bearing shell support halves; and the oil that actually comprises the bearing action. Since most crankshafts are either cast or forged, they are one piece, and the bearing journals are machined into the rough shape that comes from the casting or forging process. The bearing shells and supports are split exactly in half at the bottom of the engine block to allow the crankshaft to be inserted into top half-rounds in the block. The bearing caps comprising the bottom half rounds of each bearing are then bolted into place under the crankshaft such that each crankshaft main bearing and connecting rod journal is completely surrounded by a bearing surface that conforms tightly. The resulting bearing clearances are ideally in the realm of ten thousandths to thousandths of an inch (thousandths to hundredths of a millimeter) and the journals are virtually perfectly round. Holes and grooves in each main bearing shell allow pressurized motor oil coming from the oil galleys in the engine block to flood each bearing with oil, which continually runs out the side of the bearings and returns to the oil pan. Besides providing a thin slippery film that prevents metal to metal contact, the oil performs several other functions. First, it hydraulically fills the bearing clearance, thus providing a viscous damping effect. It also cools the metal bearing surfaces as it circulates. The journal bearing has several advantages over other types of bearing, providing it has a constant supply of clean high-grade motor oil. First, it handles high loads and velocities because metal to metal contact is minimal due to the oil film. Second, the journal bearing is remarkably durable and long lasting. Finally, because of the damping effects of the oil film, journal bearings help make engines quiet and smooth running. 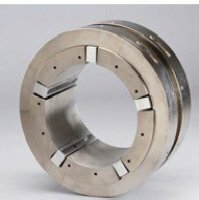 Journal bearings with their inherent advantages are also used in other high-load, high-velocity applications, such as machines and turbines.